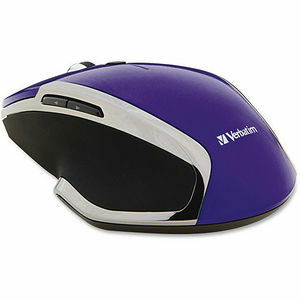 Verbatim Wireless Notebook 6-Button Deluxe Mice feature Blue LED technology, allowing users to navigate on virtually any surface, from a glass tabletop to granite countertop. Additionally, 2.4GHz wireless performance allows for lag-free cursor movement. The mouse connects to the computer via a nano receiver, small enough to plug in and leave connected - great for computing on the go. When not in use, the receiver stores conveniently inside the battery compartment. The Wireless Notebook 6-Button Deluxe Blue LED Mouse is backed by a 1-Year Limited Warranty.Wireless Notebook 6-Button Deluxe Mouse takes navigation and computing efficiency to a new level. Multi-button functionality enables you to navigate within and between applications for the ultimate computing experience. Blue LED technology lets you navigate on virtually any surface - from a glass tabletop to granite countertop. 2.4GHz wireless performance allows lag-free cursor movement. The mouse connects to the computer via a nano receiver so it's small enough to plug in and leave connected - great for computing on-the-go. When not in use, the receiver stores conveniently inside the battery compartment. Scroll wheel lets you click to scroll within your web browser or documents so no need to move mouse. Use the back/forward buttons to easily navigate between pages in your browser. Other functions include a standard left/right button and Windows 8 Home Button.